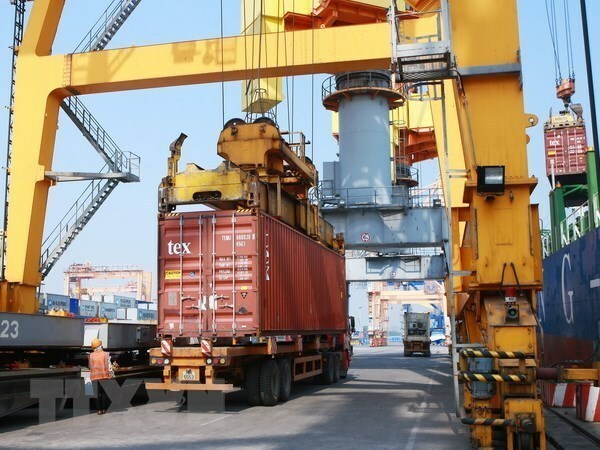 Hai Phong (VNA) – The northern port city of Hai Phong is working to develop logistics services so that they will contribute 25 – 30 percent of its gross regional domestic product (GRDP) by 2030. The target was set in the city’s plan for logistics services development until 2030. Hai Phong hopes that by 2020, logistics services will enjoy an annual growth rate of 25 – 30 percent and contribute 15 – 20 percent of the GRDP. The respective figures are aimed at 30 – 35 percent and 20 – 25 percent by 2025. The city looks to have a basically complete logistics network by 2030, when the sector will maintain a growth pace of 30 – 35 percent and its contribution to the local economy will reach 25 – 30 percent. To realise these targets, the city is developing various logistics services, especially the ones serving local seaports and airport such as goods transportation, customs clearance, and container storage and loading services. By 2025, it will develop six logistics centres able to handle about 90.65 million tonnes of goods per year, or 50 – 60 percent of the goods volume that needs logistics services in the city. These centres will be upgraded and expanded by 2030 to handle 140.35 million tonnes of goods each year, or 60 – 65 percent of the goods volume needing logistics services. Under this plan, the city will promote the training of logistics human resources to raise the rate of trained workers in this sector to 70 percent by 2025 and 80 percent by 2030. Chairman of the municipal People’s Committee Nguyen Van Tung said Hai Phong is a port gateway which ranks first in the northern region and second in Vietnam in terms of the goods volume handled.